This Miami Dolphins Fan Guide will give you an insider’s look at what it means to follow the fins. You’ll learn about traditions, top players from days gone by and currently, the season schedule, Twitter accounts to follow, and more. Despite a recent run of mediocrity, the Miami Dolphins were once considered a storied franchise in the NFL. Although marked by organization disfunction lately, the Dolphins remain the only team to complete a “Perfect Season,” with their 17-0 finish and Super Bowl championship in 1972. The team’s legendary coach, Don Shula, is the NFL’s all-time leader in wins. With Shula at the helm, Miami managed only two losing seasons in 26 years. During the latter half of Shula’s tenure, Dan Marino burst on the scene, going on to be one of the most prolific passers in league history. 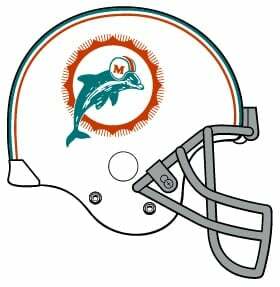 The Dolphins have won two Super Bowls (1972, 1973), five conference championships and 13 divisional crowns. The Dolphins have made 23 playoffs appearances in their 52 seasons but haven’t won a playoff game since 2000. 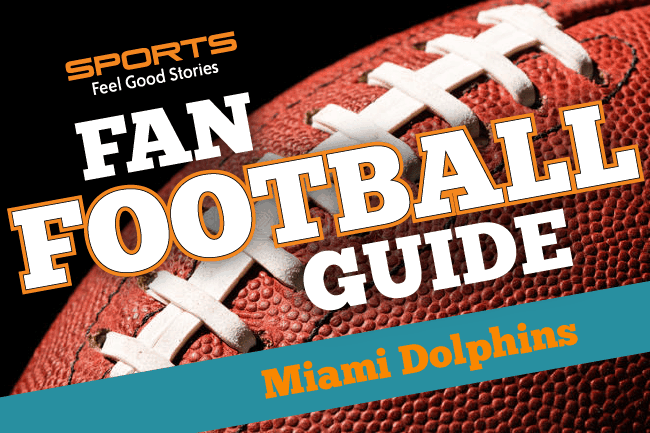 Enjoy our Miami Dolphins Fan Guide. In 1992, the Miami Dolphins partnered with local charities to begin a meal distribution service near Thanksgiving. Every year since, the Dolphins franchise actively participates in this event, distributing anywhere from 550 to 1,000 meals in any given year. Players attend the event and aid in the distribution of these meals for needy families throughout Miami-Dade, Broward and Palm Beach counties. The Fight Song has echoed through the stadium after every touchdown scored by the Dolphins since the Perfect Season, save for a brief, ill-fated interlude in 2009. That year, the Dolphins inexplicably hired Jimmy Buffet, rapper T-Pain and Miami-native Pitbull to reimagine the Fight Song. The subsequent product, a terrible auto-tune ditty called “The Fins,” was met with resounding boos by the fans. As a result of fan outcry, the team eventually returned to the traditional fight song. The other notable cheer for the Dolphins is more of a gesture. The “Fins Up” salute includes players and fans bobbing a straight hand atop their forehead to mimic a dorsal fin. The hashtag #FinsUp is the overriding filter for Dolphins content on Social Media. In the wake of nearly $500 million in renovations to Hard Rock Stadium, owner Stephen Ross partnered with food and beverage corporation, Centerplate, for a more local and iconic fare at his venue. No longer the basic burger, plain hot dogs and stale sodas, Hard Rock Stadium provides a culinary experience unmatched throughout the league. The Rock boasts local restaurants including Coyo Taco, Celebrity chef David Chang’s famous fried chicken joint, Fuku, and Grown, the first 100 percent certified organic restaurant within a sports stadium (and owned by former NBA star Ray Allen). Coach Shula’s restaurant, Shula Burger, boasts five locations. In addition to the great food, Hard Rock Stadium also features over 50 beers on tap, including 18 Florida-specific craft brands. The Dolphins-Jets rivalry stretches all the way back to the very beginnings of the franchise. They’ve met 103 times and the Jets hold a 54-50-1 advantage overall. Their only postseason meeting came in 1982 in the AFC Championship game, a contest the Dolphins won 14-0. This rivalry is fueled in part by the geographical rivalry between Miami and New York City. Some of the most memorable moments include former University of Miami star quarterback Vinny Testaverde leading the Jets to an improbable comeback win on Monday Night Football, as well as Dan Marino’s famed “fake spike” play. This rivalry also finds its roots in the 1960s, and despite recent dominance by the New England Patriots, the Dolphins lead this all-time series 54-51. Miami is one of 10 teams to sport a winning record against the Patriots. Tom Brady is 21-10 all-time versus the Dolphins, but 7-9 in Miami. Some of the rivalry’s most memorable moments include Miami’s (2-11) upset of the Patriots (12-1) in 2004. In 2008, the Dolphins birthed the Wildcat formation and flummoxed Bill Belicheck. The Dolphins remain the only team other than the Patriots to win the AFC East since 2003. The Dolphins and Bills have played 108 times, with the Dolphins leading the overall series 60-47-1. The Bills hold the upper hand in postseason matchups, with a 3-1 lead including, winning the 1992 AFC Championship game. This rivalry was characterized in the 1990s by the quarterbacks, Dan Marino and (former University of Miami great) Jim Kelly, and some ugly moments, including when then-Dolphins linebacker Bryan Cox exited the tunnel with an inappropriate gesture for the Buffalo faithful. The Dolphins have also had some storied rivalries with the Pittsburgh Steelers (especially in the 1970s), the Oakland Raiders, and the San Diego/Los Angeles Chargers. For the modern dol-fan, Jason Taylor’s No. 99 hasn’t been officially retired yet, but it hasn’t been in active circulation for players for years. Tannehill is expected to be medically cleared for the off-seasons activities, but when he takes the field it will be for the first time since 2016. Dolphins’ brass has put complete faith in Tannehill for this season, after electing not to draft a quarterback. Tannehill returns to the huddle with a completely new receiving corps. According to NFL pundits, the Dolphins may have had the worst offseason of any team. The Dolphins moved on from stars Ndamukong Suh, Mike Pouncey and Jarvis Landry, this after trading Pro Bowl running back Jay Ajayi in season. These moves were made for chemistry concerns, but they have completely shifted the pressure to third-year coach Adam Gase. Will the Dolphins ever have an Up-tempo Offense? Gase is supposed to be an offensive genius, but the Dolphins offense was historically bad last season. With some of the off-season changes, the Dolphins have tried to increase the team’s IQ and bring in versatile players. Under new Offensive Coordinator Dowell Loggains, the team will again try to install an up-tempo, no-huddle attack. 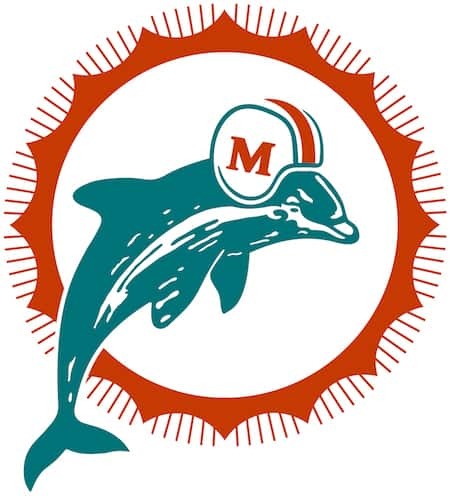 For the most part, the franchise’s logo has always featured a leaping dolphin amid an orange sunburst. That’s the iconic look of the brand. The colors have always been aqua, coral and white. For the 2018 season, the Dolphins caved somewhat to fan pressure to bring back an “old-school” look. The Dolphins will take the field with a simplified color scheme that harkens back to the 1970s. As a franchise, Miami sports eleven members of the Pro Football Hall of Fame who are almost exclusively associated with the Dolphins. Some of those names include titans of the sport, like Marino and Shula. The founding partner and original owner of the franchise, Joe Robbie was a major figure in South Florida through his passing in 1990. Robbie used private funds to build the team a stadium in 1987, and the venue held his name through 1996. Robbie’s statue starts the team’s Walk of Fame at the stadium. This is easily the most memorable name associated with franchise. When he retired in 1999, Marino owned all of the major passing marks in NFL history. He made it to the Pro Football Hall of Fame in 2005. Perhaps the most beloved figure in franchise history, head coach Don Shula led the Dolphins through their golden days. Shula finished his career with 347 wins, still the top mark in league history. He brought the Dolphins to national relevance in the early 1970s, including helming the NFL’s only Perfect Season in 1972. Shula was enshrined in the Hall of Fame in 1997. The first “star” Miami Dolphin, Griese led the Dolphins to three consecutive Super Bowls in the 1970s, including two Super Bowls wins (VII and VIII). Although most fans don’t remember the quarterback’s playing days, many do remember his contributions as a television commentator. Bob’s son Brian was a high school football star in Miami and spent one ill-fated season with the Dolphins in 2003. Griese was elected to the Hall of Fame in 1990. The latest Dolphin to be enshrined in Canton, Taylor is the greatest defensive player in franchise history. JT has the fourth most forced fumbles (47) of all-time and is tied for the most fumble recoveries (29) of all-time. He is the NFL’s all-time leader in career touchdowns for a defensive lineman. His 139.5 career sacks are seventh most all-time. Check out the all time greatest plays and highlights video. Ryan Tannehill – Coming off consecutive knee injuries, Tannehill remains the franchise quarterback for the Dolphins. Head coach Adam Gase has pinned the team’s hopes on Tannehill’s return, despite the quarterback’s not playing in an NFL game since 2016. Minkah Fitzpatrick – Despite obvious needs elsewhere, the Dolphins used their 2018 first-round pick on Fitzpatrick. The former Alabama safety earned the praises of his college coach Nick Saban, who called him one of the smartest players he’s ever coached. Fitzpatrick’s versatility should improve a leaky Dolphins secondary. DeVante Parker –Headed into his fourth season, Parker’s physical attributes (size and speed) have always marked him as a potential Pro Bowler. But Parker’s injury-plagued history and general disappearing acts leave his future with the team uncertain. Adam Gase enters his third year at the helm of the Dolphins this season. Gase is considered an innovative offensive mind and quarterback-whisperer. He’s part of the Nick Saban coaching tree and learned much of his offensive system from Mike Martz. Gase worked closely with Peyton Manning while in Denver. He’s 16-16 as head coach, 0-1 in the playoffs. Stephen Ross has held majority stakes in the Dolphins since 2009. He’s consistently pumped money into the franchise and stadium, but during his tenure the team has been characterized by almost comical mismanagement. Ross made his name in New York real estate, and is a major benefactor for his alma mater, the University of Michigan. Fin it to Win it! You might like our complete collection of Funny Fantasy Football Team Names. Are you just starting a league up? Check out our fantasy football league names ideas. Dolphins Offensive Coordinator Gary Stevens after 1997 playoff loss. Q: How many Miami Dolphins does it take to change a tire? A: One, unless it’s a blowout. In which case, they all show up. Q: What’s the difference between the New England Patriots and the Miami Dolphins? A: The last Patriots Super Bowl team picture isn’t in black and white. MIA is the perfect abbreviation for the Miami Dolphins. The Dolphins local coverage of the team is spread over the three counties in South Florida. The Miami Herald sports Armando Salguero, Barry Jackson and Adam Beasley as contributing voices. Broward’s Sun Sentinel features Chris Perkins and Omar Kelly, while the Palm Beach Post publishes Jason Leiser. USA Today’s Dolphins coverage is headed by Antwan Staley. David is a freelance sports writer based in Miami, FL, who has spent the last 15 years as an English teacher. He holds a Master’s Degree in English and Creative Writing, and has coached high school basketball for 10 years. Follow him on Twitter: @ByDLFernandez. You’re on Miami Dolphins Fan Guide page.